How Does it Feel To Finish a Book? This morning I finished the third book in my ‘Unicorn in New York’ series (illustrated by Oscar Armelles). So, I’ve finished! Whoop. Typing THE END is always a magical feeling, but it’s also a slightly strange sensation. This may be partly down to the fact there’s none of the firework-bursting, cork-popping, crowd-cheering sense of occasion you get with other creative jobs. No one calls you on stage to take a bow like they would an actor. No one throws their pants at you like they would a rock star (although, to be fair, I’m fine with that – it’s taken a while to train my family to use the laundry basket and I don’t want to confuse them). Putting on my rollerskates and whizzing through the streets near my home pretending to be twelve again. Ringing all the friends I’ve neglected while I’ve been writing and lining up things that involve me actually leaving the house over the next couple of weeks. The other thing about finishing a book is that my feelings are often quite mixed. One the one hand, I feel a massive rush of happiness and pride at having finally finished the work that’s been consuming me for months (days, evenings and middle-of-the-nights). This is accompanied by the joyfully lazy feeling that I now deserve a nice self-indulgent, sofa-based break in front of the telly. But this is followed by the realisation that, instead of lying on the sofa, I should probably be tidying my house up a bit. Because in the last few days of writing and editing I’ve scattered papers and post-its and drawings and other recyclable thinky-things all over the place. There’s also a mountain of mugs and soda cans by the sink, not to mention crumbs enough to recreate an entire packet of chocolate digestives crunched across my sofa and keyboard – testament to a delicious and nutritious diet of cake, cookies, tea and Diet Coke over the past few weeks. And, along with the euphoria, there’s a slightly manic anxiety about sending something that’s been my story until now out into the world to be read and judged. I keep remembering sections I could have fiddled with a bit more. Plus, there’s a smidgen of sadness, because characters who’ve been chatting away to me for months have temporarily gone quiet. Rachel is a graduate of both Oxford University and Cambridge University and has put her education to good use by working in an ad age by working in an ad agency, a secondary school, a building site and a men’s prison. Her interests are books, films, stand-up comedy and cake, and she loves to make people laugh, especially when it’s intentional rather than accidental. 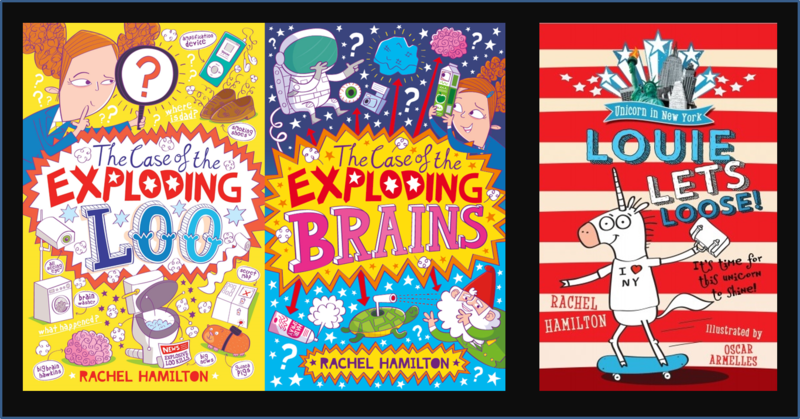 Her books include Unicorn in New York (OUP), The Case of the Exploding Brains, and The Case of the Exploding Loo (Simon & Schuster), which was nominated for the Redbridge Children’s Award, Leeds Book Award and won the Worcestershire Awesomest Book Award. It is weird isn’t it. I do feel a little bit lost now!